After having a class blog for a number of years, I have come to realise that you can’t leave parent participation to chance. Parents needs to be educated and regularly encouraged and invited to be part of your class blog. Recently, I wrote a guest post on the Edublogs Teacher Challenge blog about encouraging parent participation. Click here to read it. Last year I also wrote a post on this blog about some methods I have used to encourage parent participation. Click here to read that. 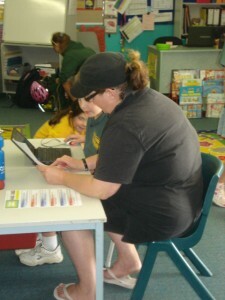 Today my class held a Family Blogging Afternoon. It was a great success! Last week, all of my students made an invitation to give to a special person in their family. 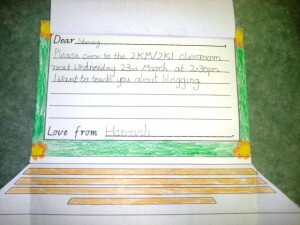 The family member was asked to come to our school at 2:30pm Wednesday to learn about blogging. We had parents, grandparents, aunts, uncles and other family members come along. Almost all students brought someone along and proudly showed off our class blog. 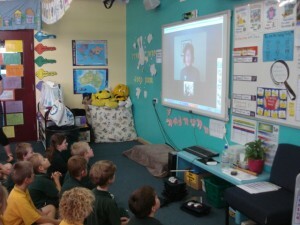 We launched our Family Blogging Afternoon by skyping our blogging buddy in California, Mrs Yollis. Mrs Yollis told everyone about some of the benefits of educational blogging in regards to literacy, community building, geography and internet safety. 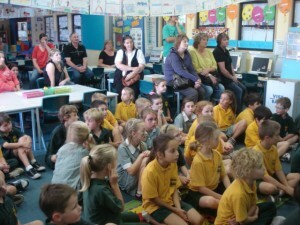 It was fantastic for the parents to see how we connect with others via Skype while hearing about the benefits of blogging from another experienced teacher. Following the Skype session, all the students showed their special person a copy of our poster about writing quality comments. The students then taught their special person how to navigate our class blog and how to leave a quality comment. I prepared a special post for the parents to comment on that asked them to reflect how school had changed since they were students. Last year I discovered that these sorts of posts appeal to parents. Everyone has a story to tell about their youth. Some fantastic comments were produced with the students’ guidance. I team teach with Kelly Jordan and we have 42 grade two students between us. We used our 10 classroom computers, 2 interactive whiteboards, 9 mini laptops (borrowed from another class) and school computer lab (26 computers) to provide enough computers for all students and family members. What a fantastic afternoon full of fun, learning and community building! Have you thought about having a Family Blogging Afternoon? What do you do to encourage parent participation in your class blog? I really enjoyed learning about your family blogging afternoon and I think it was really a fantastic idea which looks like a big success. I have just begun blogging with my students (we are using kidblogs.com), and its going well. We also have a class website (which you so kindly gave me feedback on) and I do encourage parent participation by asking them for articles they might like to share with other parents, and they often give me pictures of the children which I post. Having parents come in for a family blogging morning really is a good idea and I just might borrow it for next year! Thanks for your comment. Glad to hear your blog and website are going well. It’s fantastic that the parents give you pictures to post on the blog. Children just love seeing themselves “published”. I hope you borrow the idea. It’s a very simple concept but worked so well. I should have thought of it earlier! What a great idea! looks like a great response. Thanks for your support! I have found that everything is better when the parents feel like they are part of their child’s learning. I hope others have found this post useful. What a fabulous afternoon. 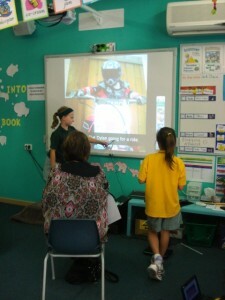 Great way to involved parents and what a fantastic way to show them by letting the students be the experts. Thank you so much! The children loved being the expert and showing their family member their new skills. Persevere – I hope you get those permission forms soon. I think a LOTE Family Blogging session would be fantastic at your school. Hi Kathleen. This is my 4th year of blogging with my students but I’d never thought of a Family Blogging session. What a great idea! Ii think that mnay of our parents visit the blog but don’t necessarily leave a comment. Maybe a PR event like this could change that. PR is pretty important isn’t it! I agree with you. Many parents visit the blog but don’t leave comments. I’ve tried all sorts of things in the past and can’t believe I didn’t think of the simple idea of actually inviting the parents in. Hopefully this has set parents up to comment regularly. We’ll see! What a fabulous idea – well done! You’ve come up with creative yet practical ways to get parents involved in the work that you and the students are doing and they should feel very lucky that their children get to be part of such a dynamic and engaging classroom. I shall definitely be keeping this idea in mind for when our blogging gets up and going! having family members coming into the classroom and introducing them to the world of blogging. You and Miss Jordan did an outstanding job. This gives every member of the family the opportunity to see how wonderful blogging is and how it is another way of learning. For I do believe this is the way it is going for I have noticed in the last year just how many more schools blogs have began. As a parent I am so glad that my daughter and I were both introduced to blogging because of you.Its been an wonderful learning experience and from that she and I have grown and are learning together. Now how great is that. Thank you for your comment and your ongoing support. I wish I had of thought to have a Family Blogging Afternoon last year! You may be glad that I introduced your daughter to blogging but I am glad at how far you and BB have taken it! It is my hope that when I introduce students to blogging, they will carry on after they finish in my classroom and you really have. It’s terrific!